I'm going to have my welded figurines on display at the Olympia Duck the Malls event this year, so if you're in the area, make sure to stop by! An awesome local craft fair taking place inside the historic downtown Olympia Capitol Theater. The sale was created to support local and independent artisans and artists in the South Sound and visual art programming at the Olympia Film Society. Duck the Malls gives the community another great opportunity to shop locally, creatively, and alternatively for the holidays and support true craftsmanship! Saturday December 13th at the Capitol Theater from 11 am-4 pm. What are the requirements? 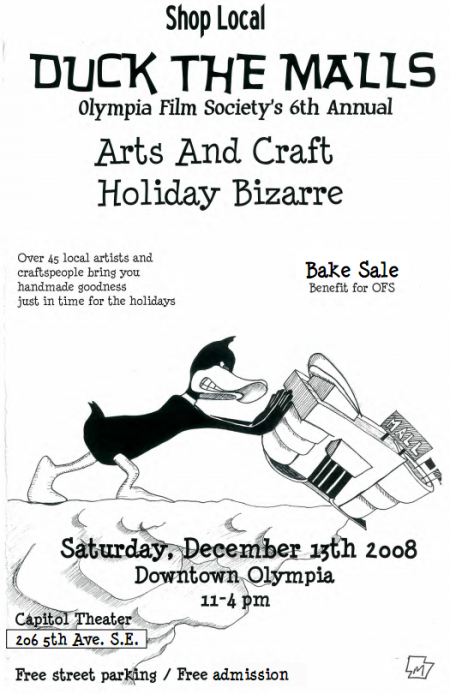 Those participating in Duck the Malls will be selling LOCAL and HANDMADE ORIGINAL objects. Those wishing to sell cds, imports, food items, cosmetic products or services won't be there. No store bought or mass- produced items. We see nothing but what our brilliant local independent artists/crafters are making, not what is being churned out in the supermalls these days.